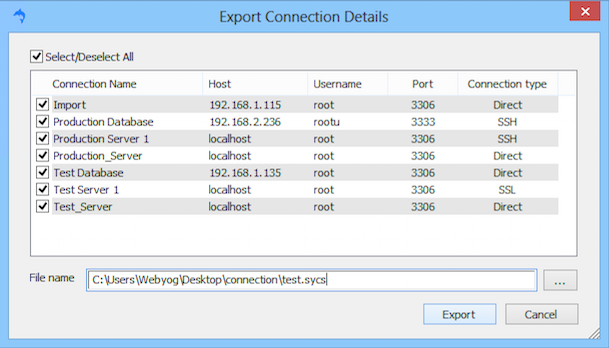 To export connections go to Tools->Export/Import Connection Details->Export Connections. This will open a dialogue with connection details, where you can select the connections to be exported. 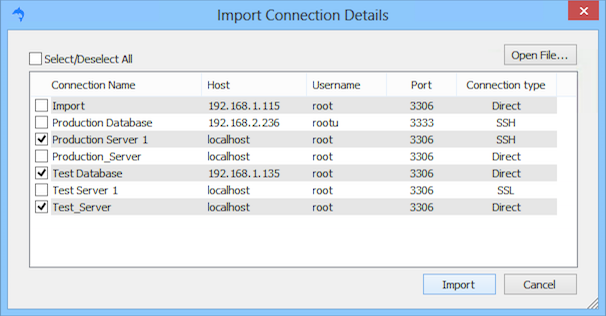 To import connections go to Tools->Export/Import Connection Details->Import Connections. Click Open File->select the file to be imported and click on import. Note: In case of conflict in connection name, if the connection detail of importing connection with same name as that of existing connection, connection name of importing connection will be appended as _(n) where "n" is next available number. Example: If a connection with the name "Production" is present in both existing and importing connection then importing connection will be imported with connection name "Production_(1)"